8 August 2017 is the 50th anniversary of ASEAN, the most successful regional organization of the developing world. To mark this occasion, I have written a number of essays and op-eds. Here are brief summaries and excerpts, along with publication details. Some are free downloads. “No regional organization in the world has a more culturally and politically diverse membership and yet has come as far as ASEAN has. Another outstanding feature of ASEAN is its shared or pluralistic leadership. Unlike some regional groups where one or two countries play the disproportionate role, such as France and Germany in the European Union (EU), ASEAN is not directed by one or two dominant members. There is no regional hegemon or wannabe hegemon within ASEAN, such as Nigeria in ECOWAS, South Africa in SADC or India in SAARC. But the essay also highlights a number of challenges facing ASEAN. The third essay is a commentary on “ÁSEAN Centrality: Myth of Reality,” Contemporary Southeast Asia, vol.39, no.2 (2017). pp.272-79. The essay begins with clarifying a few myths about the concept of ASEAN Centrality. A second popular misconception about ASEAN centrality is that it’s about ASEAN itself. More accurately, it’s really about the larger dynamics of regionalism and regional architecture in the Asia-Pacific and even beyond. I concluded the essay by arguing that ASEAN must seriously rethink its centrality. “Thailand has played a proactive and productive role that has been central to the foundation, consolidation and transformation of Asean. What is also remarkable is Thailand’s support for Asean has been maintained throughout its domestic oscillations between military and civilian rule.Now that Asean is facing another turning point in view of the escalating great power rivalry in Asia, will Thailand once again step in to move Asean forward? Thailand’s role is ever more important today given Jokowi’s Indonesia has scaled down its role as a leader of Asean. Thailand’s role in the creation of Asean, and its previous ideas for reforming Asean such as “flexible engagement”, mean that should Bangkok so desire, it can emerge as a major player in injecting Asean with a new sense of purpose and vitality to ensure its continuing relevance. This remains a major challenge for Thai governments. To conclude, while I remain a firm admirer and believer in ASEAN, I also think ASEAN, like any international institution which has been around for a while needs to adapt to the realities of a changing world order, which I call a Multiplex World. Chinese president Xi Jinping’s speech at the World Economic Forum in Davos, in which he denounced protectionism and defended globalisation, suggests that China is positioning itself to fill the void in global leadership likely to be left by the Trump administration. Since the election of Donald Trump as US president, there has been great concern about the future of the liberal international order. Mr Trump’s victory in November raises an important question: will the emerging powers defend the existing arrangements or will they give them one final shove over the edge? The End of American World Order Insights from Amitav Acharya. By “end of American world order,” I specifically refer to the crisis and erosion of the international order that the United States had built and maintained after World War II, which some call the liberal hegemonic order, meaning a liberal order under U.S. dominance. As I have argued in my book, The End of American World Order, whether the United States is declining as the world’s No. 1 power or not is a matter of much debate, although this has less to do with who is in the White House than long-term structural shifts in the global economy and politics. The United States still leads in the world in terms of the overall military power, and relative economic power (defined more comprehensively than just overall GDP, and taking into account the role of the U.S. dollar as the global reserve currency). So we don’t have agreement on whether or to what degree the United States itself is declining. You can find equally persuasive arguments and evidence from both sides of the debate. But the United States is less and less able to get its way with the international community and shape and control the agenda of global multilateral institutions that it helped to create. U.S. leadership in the world has declined. Second, governments should avoid policies that prioritise offence over defence. 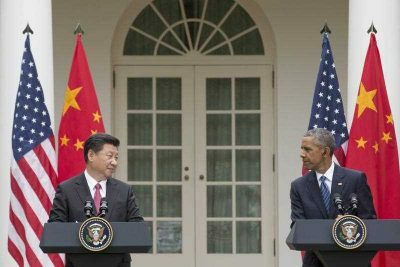 This demands fresh attention in light of the growing Chinese military presence in themaritime sphere as well as the United States rebalance to Asia. Another important part of this is to develop mechanisms to avoid incidents and accidents in areas ofcompeting territorial claims and establish channels of communication between parties. A multifaceted restructuring of regional institutions is also necessary. This includes creating more manageable priorities, avoiding duplicating tasks and developing Track II dialogues based on empathy rather than national advocacy. It should also addressmission creep in regional institutions and coordinating their activities closer with relevant global bodies, civil society groups and the private sector to address transnational challenges. This article is part of an EAF special feature series on 2015 in review and the year ahead. Yet Russia and China might signal the “return of geopolitics” in the international system. What about the Islamic world? Fukuyama dismissed the potential of Islam to offer a political alternative to either liberalism or communism. Certainly Islam, without a large or great power in its ranks, could pose no traditional Realpolitik challenge to liberalism. Yet history does not begin or end with the big ideas of big powers. The Islamic world is a massive demographic entity. There are 49 Muslim majority countries in the world, about one fourth of the total U.N. membership. The world’s Muslim population, at 1.6 billion, constitutes 23 percent of the total world population, with significant growth among its youth. Indeed, these demographic facts feature prominently in Huntington’s list of reasons for the clash of civilizations between Islam and the West. Adding China’s 1.35 billion to the equation means that about a third of the world’s population theoretically remain outside of the West’s triumphant ideology. Even an ardent believer in democracy, such as this author, finds Fukuyama’s claims that there are no “real alternatives” (what constitutes real?) to Western style liberal democracy and that “we should have no doubt as to what kind of society lies at the end of History” too sweeping, arrogant and deterministic. More damning for the Huntington thesis is the fact that the overwhelming majority of the targets and victims of violence perpetrated by Islamic extremist groups are Muslims. According to the University of Maryland’sGlobal Terrorism Database, between 2004 and 2013, about half of all terrorist attacks and 60 percent of fatalities caused by terrorist attacks took place in just three countries: Iraq, Afghanistan and Pakistan, all with Muslim-majority populations and epicenters of the War on Terror. A 2011 report from the U.S. government’s National Counter-Terrorism Center (NCTC) estimates that “in cases where the religious affiliation of terrorism casualties could be determined, Muslims suffered between 82 and 97 percent of terrorism related fatalities over the past five years.” Contrary to Huntington’s thesis, the violence that occurs in the Islamic world is mainly a clash within a civilization. The above also applies to Ukraine. Here is a striking example. Huntington had predicted in his 1996 book, “If civilization is what counts, violence between Ukrainians and Russians is unlikely.” Obviously it does not.